British, and indeed international, news reports continue to be dominated by Brexit as the official deadline day rapidly approaches. The past week has been particularly turbulent in the House of Commons, with Parliament expressing their views on several Brexit-related votes and making a ‘No Deal’ Brexit unlikely. That the default position of a No Deal Brexit remains in place is an unusual scenario given that it would benefit nobody. An increasing possibility is that the UK does not leave the EU on 29th March 2019 as originally planned and a delay of a couple of months, years or even a cancellation may occur. We firstly wanted to know how the UK’s decision to vote to leave the EU had affected their finances from 2016 to now. While 43% said that their finances were largely unchanged, more than a third (35%) felt they were worse off, compared to only 22% saying they been positively impacted. 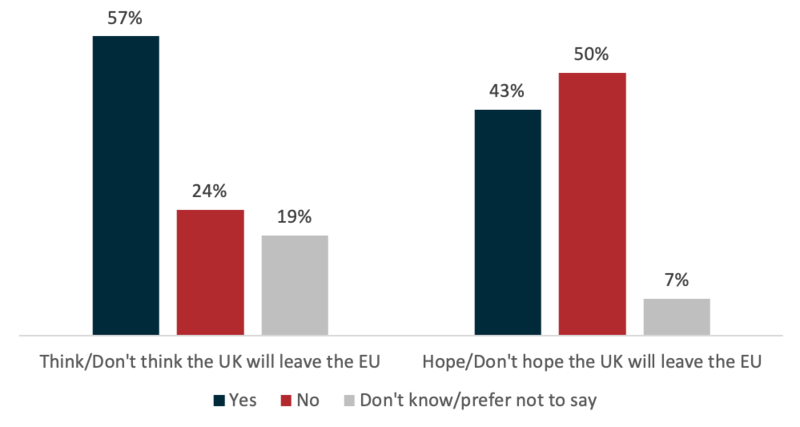 Encouragingly for the UK, 46% stated that they would invest in the British company while 26% selected the European company and 28% had no preference. We then investigated various scenarios where the rate of return was not equal to try to discern the cost of being loyal to British based investments. While we continued to observe some degree of loyalty to British investments at unequal levels, many investors will chase outperforming returns wherever they can be found. This should signal to the administration that if Brexit does make British companies less competitive internationally, investment flight from the UK and foreign investment into the country could be adversely and quickly impacted. The potential flight of private British capital could create a long-term, self perpetuating vicious cycle in the UK economy which will be difficult to break out of. To counter this, the May administration will need to place significant emphasis on job creating foreign direct investment. At the time of writing, the EU has said that it will only grant a short extension to the Brexit deadline if the British Prime Minister can pass her Brexit deal before 29th March. A revised Brexit deadline of May 22nd or June 30th seems increasingly likely. Whether this happens or not remains to be seen, with the uncertainty continuing to play havoc with groups such as our affluent UK investors. If you would like to subscribe to our periodic release of luxury and wealth reports please enter your email address below. We will respect your privacy and not disclose your details with any 3rd party, nor contact you directly for sales related activities.